This Varoma dish is very tasty & so easy! Imagine spending only 5 minutes in the kitchen & then 20 minutes later, dinner is ready! You can even marinade the chicken up to 24 hours ahead of time. I’ve adapted this recipe from an old cookbook of mine. In that recipe the chicken was marinated, grilled on both sides & then cooked in the oven. 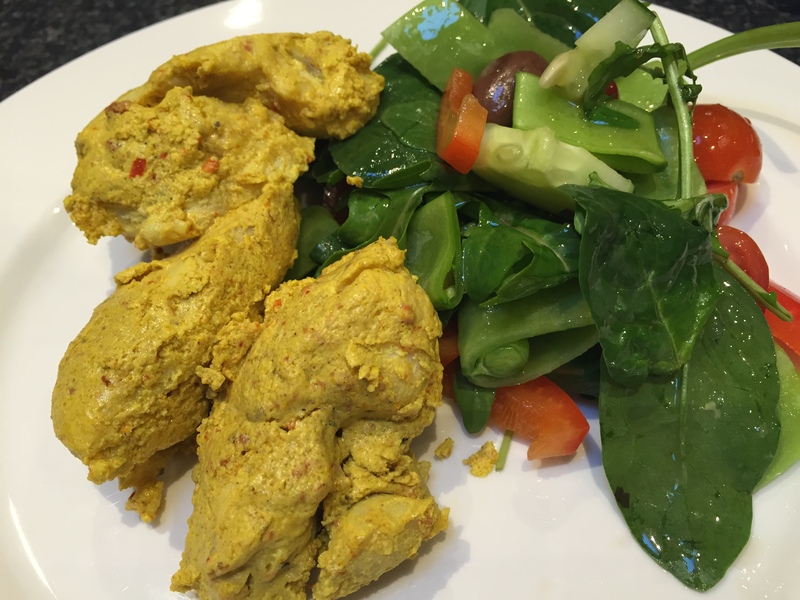 If you have’t used your Varoma for cooking protein, you really need to give it a try. It’s very easy & the end result is very moist & tender. The flavours of this dish are lovely & you can adjust the chilli to your tastes. I personally don’t like foods too spicy, so I used 1 teaspoon of dried chilli. If you’re cooking for the kids you may wish to just use a half teaspoon or leave it out. Even if I’m only cooking for one or two, I always cook the full recipe & keep the left over chicken for lunches or another night’s dinner. As the chicken breasts are cut lengthways, they are fantastic served in a wrap for lunch or with a salad! 1) Combine yoghurt, spices, seasoning & lemon juice in a large bowl. 2) Cut chicken breasts lengthwise into 3 or four pieces each. Add chicken to bowl & ensure chicken is thoroughly coated in yoghurt mixture. (This can be done up to 24 hours ahead of time). 3) Place 1 litre boiling water in TM bowl. 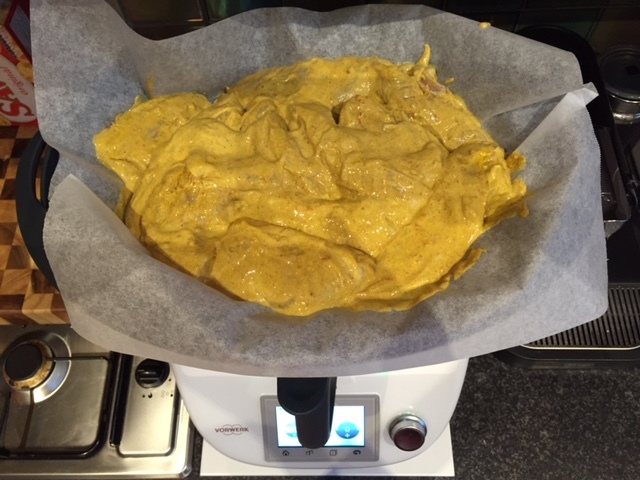 Line Varoma tray with a sheet of baking paper & spread chicken evenly over the tray. Pour any excess yoghurt mixture over chicken. 4) Insert Varoma into position & cook 18 minutes/Varoma temp/speed 3. 5) Check that chicken is cooked through. If not, cook for a further 2-3 minutes. 6) Serve with a simple salad, vegetables or with cous cous or rice. Vegetables can be added to the Varoma dish during the cooking time – ensure there is a gap in the veggies, so the steam can get through. 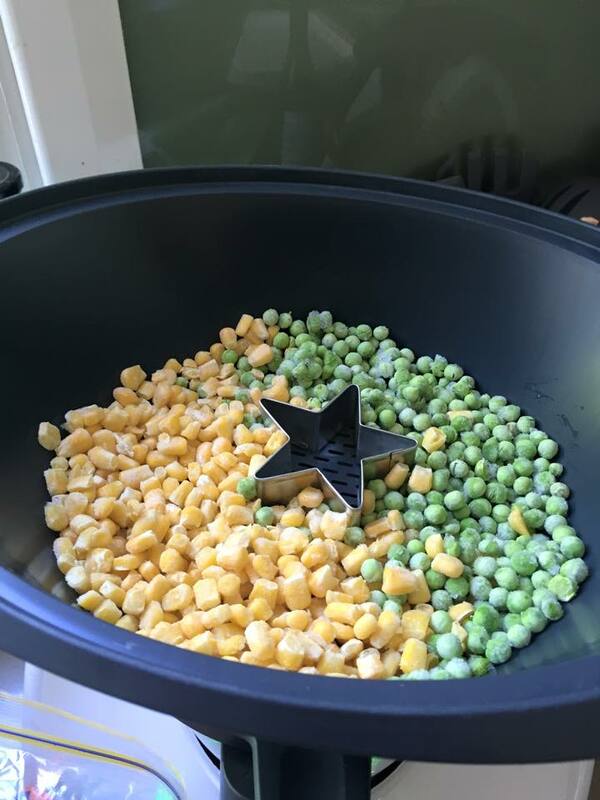 Here’s a fantastic Varoma tip – you can put a cookie cutter in your Varoma dish, to make a gap for the steam to get though, which ensures even cooking. 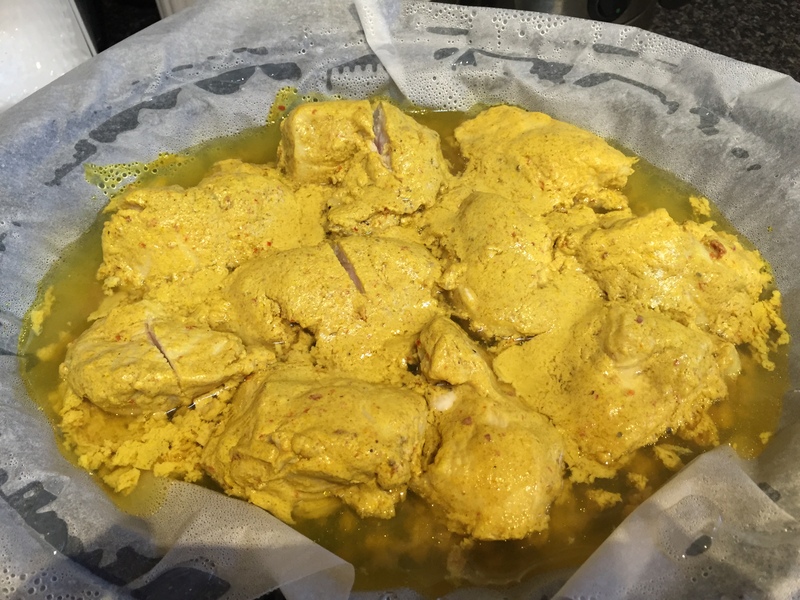 Sometimes, the use of Tumeric in your cooking can cause the TM lid or Varoma to stain green. This can also happen when using Saffron & Mustard Powder too. Don’t panic if the lid or Varoma do stain. If you leave them outside, in direct sunlight for a few hours, the stains will fade. Because I line the Varoma dish with baking paper, my Varoma doesn’t stain (but the baking paper will). 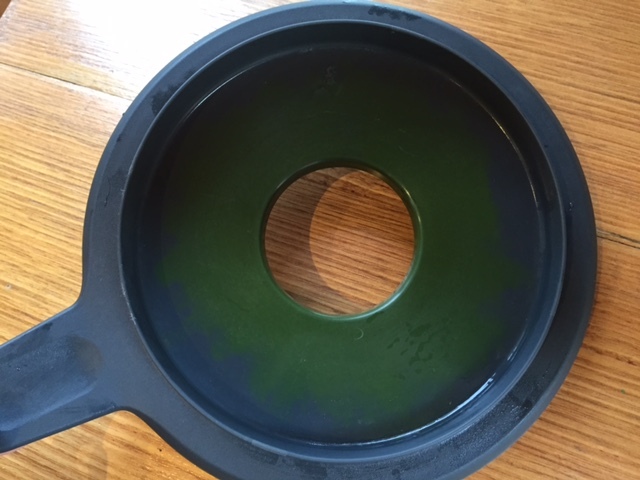 If you don’t use baking paper, your Varoma tray & dish will stain green.